Click HERE to go to other pages. The above are the nine primary sections of this website. Click on them to go to those sections. This site has been substantially re-designed and upgraded to all-device interactive version on July DD, 2018. You may need some adjustments for the first time. Please click on 'Details' below to know more and click again to close it. In case you had visited the previous version of this site earlier on the same device which you are using now, you may see the old version of some pages or all the pages. In that case, you will need to refresh the page(s) for the first time only. The appearances of the two versions are quite different from each other, so there won't be any confusion. NOTE: The last snap 'Old version on Smartphone' does not accommodate the full width of the page on the screen, and a lot of it is cut off outside the view. The user has to either scroll right and left to read all contents or zoom out to small size to fit everything, in which canse, the fonts will become too small to read. 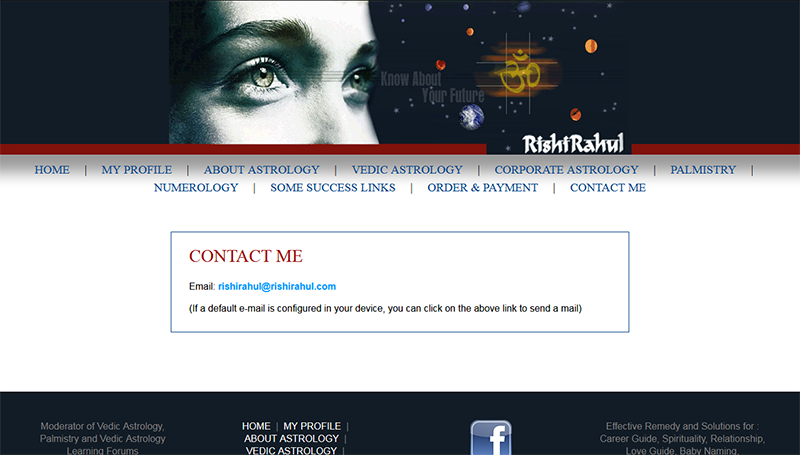 RishiRahul, with his 36 years' research experience in man's spiritual search for meaningful outcomes, and human understanding in life, assists in providing appropriate solutions through accurate timings of future events in life through this dedicated site with the collective use of Vedic Astrology, Krishnamurthy Paddhati, and Tajik system of Astrology, Progressions, Numerology and Palmistry, by helping you to foresee and understand the future. Additionally, Palmistry skills are applied to form/predict the ‘skeleton/landmarks’ in timings; while Numerology skills provide the Philosophy, dimension anf much needed bond between Astrology & Palmistry ONLY well perceived when used collectively. 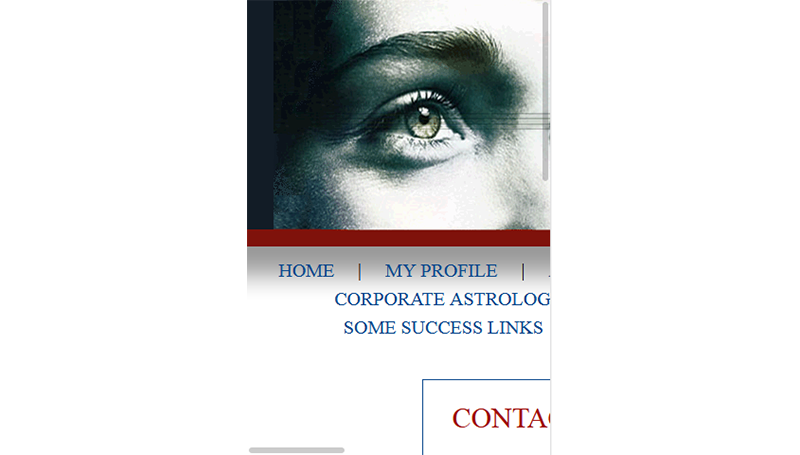 My motto is Accuracy of events, proper guidance along the client’s life/ destiny path and client satisfaction. Doubts will be cleared and answers given to any number of queries regarding the topic in consideration at no extra cost till proper understanding is reached. Prescribing gemstones to ward off planetary afflictions in the birth chart of a person is a very delicate procedure. The prescription of a gem depends largely on the astrologer's keen observation, understanding and intuition; while the stone should also match the qualities of the person. The gem should be able to arouse and enhance the qualities required towards positivity and success, boosting the natives luck and prosperity, reduce bad qualities and enhance the good ones. Results of the year ahead or annual results are very specific to the year and event in whichever respects the native desires with timings in respect to education, love, marriage, marital life, success of desires, attainment of career objectives, career changes, normal and chronic health problems, finances, business, children factors, parents, foreign travels, spiritual attainment, best periods, worst periods, monthly results. Going beyond giving computer generated stories, giving answers to specific questions with accurate timings. My communication will enable you to both foresee and understand the future, navigate the sharp turning points, and handle their energies in resonance to your well-being. I am RishiRahul. 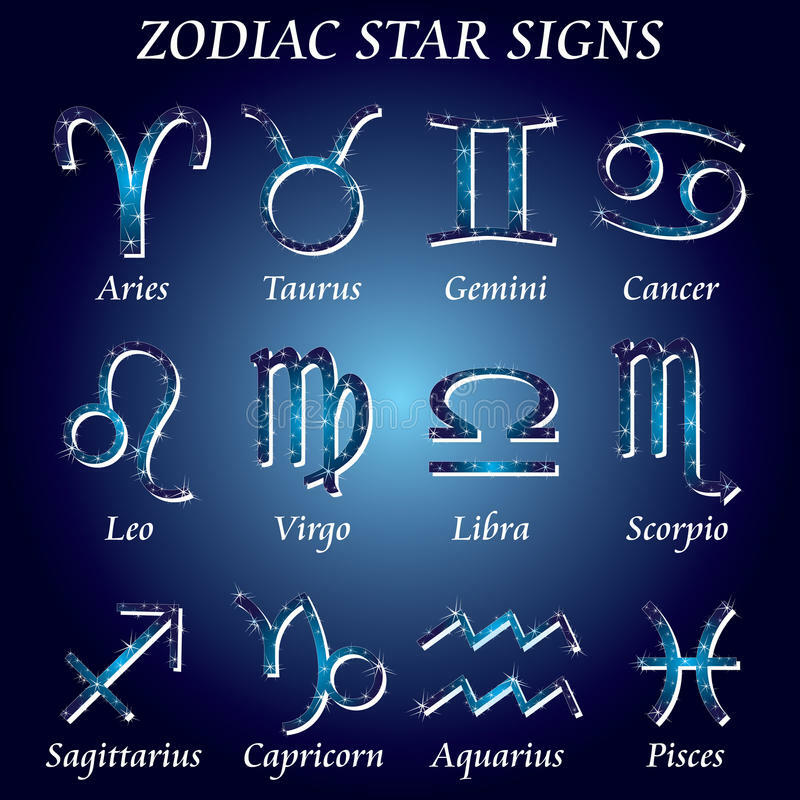 I have been researching and practicing Vedic astrology, Krishnamurthy paddhhati, Tajik, Western Astrology, Palmistry, and Numerology for the past 36 years. Specifically, I assist my clients in identifying and timing significant life events like marriage, job changes, other important events etc as well as give remedial measures directed to guide in order to better lives. Every life event is corroborated the above 5 to 6 divination methods leading to minimal error margins, more or less evident in the success links on this site. I also diagnose past karma and suggest remedies to mitigate their undesirable effects. Predictions are made by me personally using 5 to 6 divination methods (Vedic astrology, Krishnamurthy paddhhati, Tajik, Western astrology, Palmistry and Numerology). Predictions are made after 10 to 15 hours of study and research with the birth details etc, and the report is absolutely not general, but personalized and typical to the person, involving perfect and detailed timings, rounded off to months in specifically desired cases, and generally to 6 months to a year. Free consultations and diagnosis sessions for a 2 month period will be given on the questions previously asked. This involves a lot of back and forth communication to ensure that the native has a complete and satisfactory understanding of the chart queries and life purpose. This is not my main profession. I am a fully pensionable service holder and do not depend financially on this consultancy for a living; and it is very much an age old passion of mine. But I would like to be paid for my time to also garner resources for site maintenance and further research. 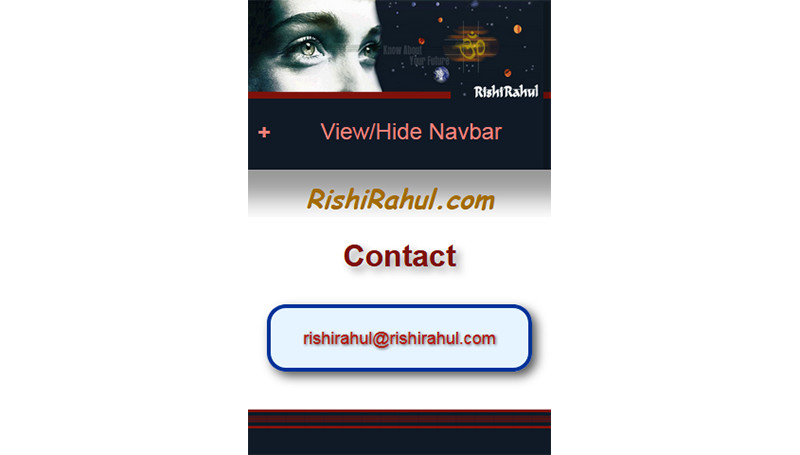 Career Guide, Spirituality, Relationship, Love Guide, Baby Naming, Marriage Matchmaking, Manglik Dosha, Money & Finance, Education, Children & Progeny, Business & Partnership, Sade Sati, Kalasarpa Yoga, Health, Foreign Travels. 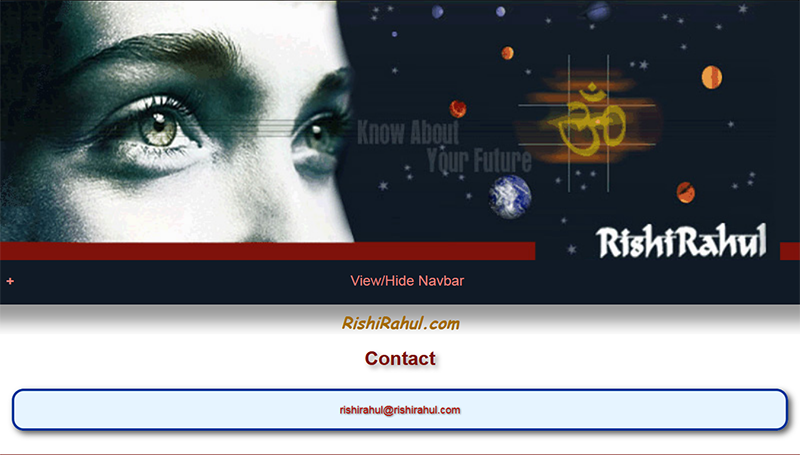 Some contents of this website are sole properties of RishiRahul. Any copying or reproducing them may need his permission.